Nice work! Maybe the leaf blower is my favorite. Thanks Eric! 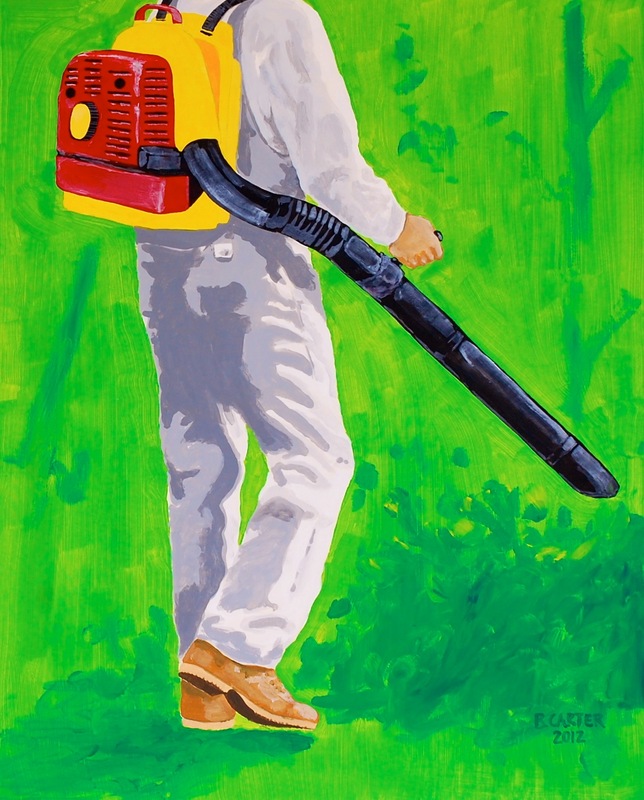 The leaf blower is the first I finished, and the first that sold when I showed them all earlier this year. They are all good and it’s an interesting theme: bodies, plus (manicured) nature, plus gardening machines. Ironically, one of the reasons I like the leaf blower the most is that it’s probably the machine in question that’s the most loud and ridiculous. I gotta’ go back and look for the weed whacker. Wow, the weed whacker is sweet. Also interesting that the people are all headless. Why hasn’t anyone mentioned the dead squirrel and the blood on the hem of his trousers? Thanks Rosie! I’d been wondering the same thing.